** Willans Harnesses have not been available since 2018. We have found the following to fit right in with our needs for the single seat racer. Shoulder straps are 3" / 2" wide for HANS use only, standard length of 15". Lap straps are 2" wide webbing. Crutch straps are 2" wide with 1" loop one end to be passed through the "D" rings on the lap straps before passing through the shoulder strap down through the loop prior to connecting into the release mechanism. All straps fully adjustable. 3"/2" shoulder straps use 3" adjuster. 2" lap straps and 2" crutch straps use double steel attachment lugs to give pinch plate adjustment for control of straps. Crutch straps are designed to stop driver submarining through the harness in high "g" decelerations. TRS lightweight 140 gram quick-release buckle of composite construction, multi-point, quick-release is used for central fastening. Shoulder and lap straps connect individually to the release mechanism, except the right-hand lap strap which is fixed. Silver, yellow, green and orange are manufactured to order. 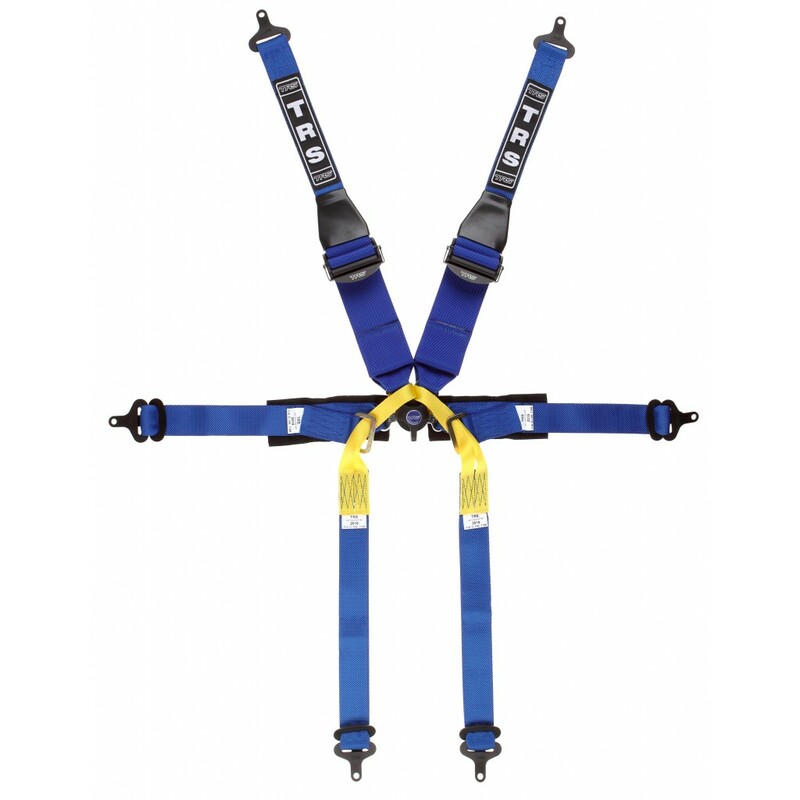 Inquire for TRS harnesses for other classes. SCCA, NASCAR, NASA and many other sanctioning originations, require/recommend SFI certified roll bar padding on roll cage members in close proximity to the occupant's helmet or body. Split foam "pipe insulation" that has been used for years, is discouraged because of it's ability to support fire, give off fumes when burning and it's low energy absorption. 1. Impact Attenuation. The peak acceleration shall not exceed 200 times the force of gravity (g) for any first impact. Second and third impacts shall not exceed 225g's. The Severity index value shall not exceed 1250 for any impact. 2. Flammability. The after-flame time shall be ten seconds or less. Additionally, no melting or dripping may occur. SFI 45.1 Specification, molded, Roll Bar Padding.